Crossway’s Theologians on the Christian Life series was designed to help Christians learn from the great teachers of church history—bringing modern readers wisdom from the past for life in the present. Few things are more important for the Christian life than participation in the larger Body of Christ—the church. 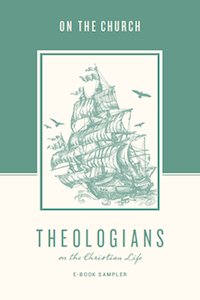 In this digital sampler, we’ve pulled together an assortment of chapters on the church from volumes in the Theologians on the Christian Life series. We hope this sampler spurs you to reflect more deeply on the nature and importance of Christ’s church, “which is his body, the fullness of him who fills all in all” (Eph. 1:23).